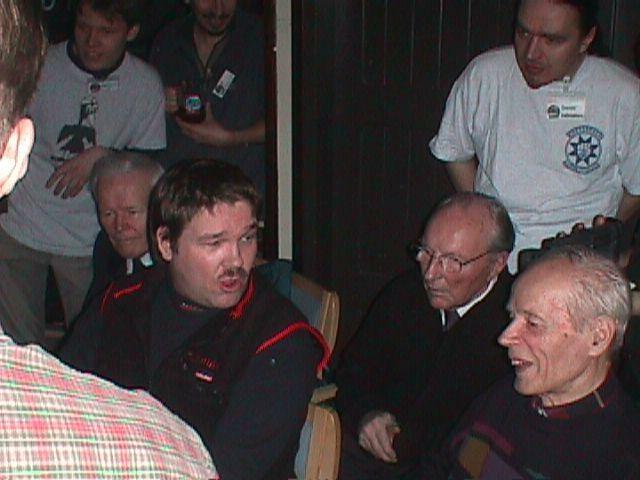 Mr. Torsten Sannamo, a machine-gunner and wireless operator of the wartime Bomber Squadron 42, participated the Urban Blitz 2002 winter event of Virtual Pilots at Tampere, 2nd February 2002. He gave the following presentation of especially the effect of the German FuG airborne radios to flight operations. Urban Blitz 2002 -convention's online report can be found from www.compart.fi/icebreakers/blitz02report.html. I was enrolled in a Fast Track Course of a Machine Gunner and Wireless Operator at the Suomenkasarmi Barracks of Hämeenlinna, where the Air Force Signals School was then. They didn't even tell us at the Headquarters, which training we were to participate. There were 26 of us from different Blenheim squadrons arriving at Hämeenlinna. At first there was a closed briefing, where we were told to be "in a confidential mission, which was to remain classified”. This confidential mission was to be trained in use of the new radio equipment of the Air Force. The training lasted 20 days. The flights took off from Parola Airfield, and the rest of it took place at the barracks. We wondered about all this secrecy. Obviously it was because of the new long-nosed Blenheims (last batch of Finnish Blenheim bombers was delivered to operational squadrons in 1944). 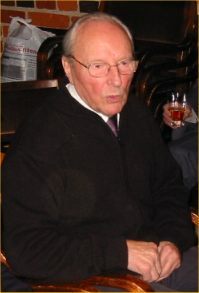 Their final assembly was being completed maybe at several locations here at Tampere, and Orivesi and Kuortane as well. And they were equipped with the new FuG homing and radio equipment. 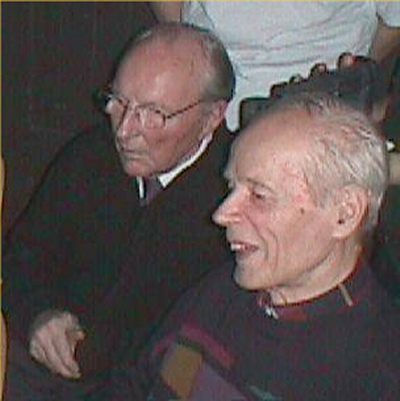 Kauko Aho (read the articles about mr. Aho: Blenheim Pilot In The Continuation War and The tale of a bomber pilot) and Torsten Sannamo at Urban Blitz 2002. 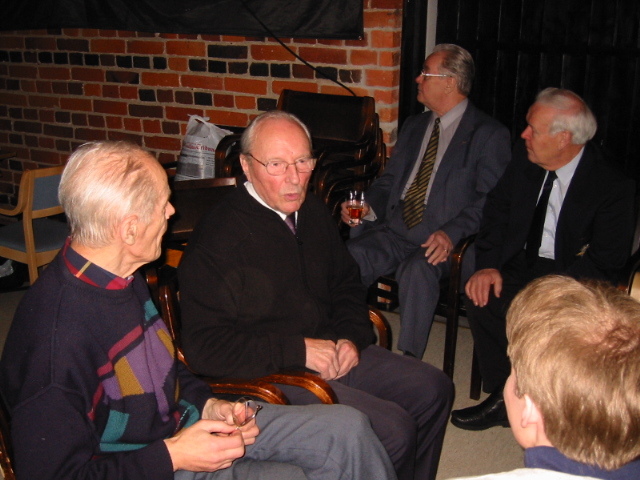 In enlarged picture also the veteran aviators Torsti Tallgren and Lauri Väisänen. There were three of us: Tomi, Eetu and I, receiving this mission, and we started with some reconnaissance. There was a gym hall at the barracks, with the ceiling slanting upwards, and a ventilation tube in it. We went up in the attic and noticed that the ventilation tube could be detached. We suddenly got an idea of using the old climbing ropes that we saw there, as it had been a gym. We planned to get in the attic all of us, Tomi first descending on a rope as Father Christmas, and we little helpers then after him. And that's what we did indeed. The sound of drums was agreed as a signal for Santa Claus to come in. The rope then came down and Santa started descending on it. Just after him having passed halfway, the rope suddenly slipped loose from the pole on which Eetu had fixed it by a sliding knot. Santa fell free on the floor from the height of about two and a half meters. Fortunately he was carrying a sack on his back, landing on top of it. In the hall there was a silence of death. We looked on frightened about what had happened. Tomi then stood up, put aside his mask and yelled upwards "You bloody elves!” We scrambled to descend on another rope, which I properly secured by a pole knot, being an ex-scout. Everybody thought it was all pre-planned, and we got an enormous roar of applause. I must tell you about an incident involving that FuG, how it saved the lives of our three-man crew. Or really two of us, because one was already wounded. We had been bombing the hardware depots of the Russians at Aunus, when this withdrawal phase of the war began. Our secondary mission was reconnaissance, how much material was transported towards Finland from Aunus. We flew along a highway, and obviously both the navigator/bomb aimer and the pilot were so concentrated in their ground observation that they failed to notice three LaGGs heading at us from straight ahead. One of them got a chance to fire accurately and shot a burst on the nose of our plane. I went there in front of the plane and took off my parachute to see him. Atte was still conscious but all pale and asking what had happened to him. I opened his flight overalls and saw immediately things weren't well. A strong smell of blood came from his overalls. I had the plane's first aid kit with me and I tried to place all the largest bandages there. But the projectile had perforated his stomach and come out through his side, and it had been one of 20 mm calibre, so you understand it was impossible to close that hole while still airborne and in a cloud. Thereafter I went quickly back to the rear. My earphones were plugged off and the pilot shouted at me "switch on the FuG so we can locate us”. Our pilots also had started to rely on these FuGs. 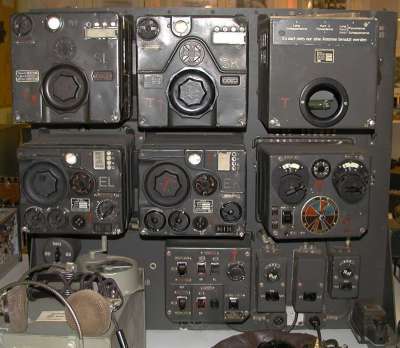 While we still had the Helvar radios in the Blenheims, operated with fixed antennas at longer distances, they were quite unreliable. I remember a night navigation exercise when I had to locate the turning points of a triangle. We took off from Luonetjärvi and I tried my best, until the pilot, Kude Virtanen, asked me "tell me now, Torsti, where are we?” I replied we are in an airplane. And he said try to locate us now. We could only spot a single sparkle of light, and at our descent we saw a train that had arrived at a station, and there was just enough light to locate us and we then could return to Luonetjärvi. But now I had the FuG and I switched it on. I was already connected with the pilot through the intercom and he said "isn't the nearest airfield Mensuvaara, contact them”. But we couldn't do it directly, we had to contact them via our base at Värtsilä. I reported to Värtsilä, requesting them to contact Mensuvaara and tell them that we had a wounded First Lieutenant aboard, and if they could send two Brewsters to meet us. We were afraid the Russians could follow us, because this communication was by voice, which was normally forbidden. We stayed in the cloud and I told the pilot "you are pulling too much to the left, can't you hear from the sound, the homing sign is totally wrong compared to our heading?” He said the gyrocompass displays a heading towards the north. Until he started turning, he didn't notice the gyrocompass had been broken after a hit from the burst, and it had got stuck to show north. The pilot had to search for a continuous sound of the FuG to find the correct flight path. If it was to the left, it sounded DAH-DAH-DAH-DAH, if to the right it was DIT-DIT-DIT-DIT, and a continuous sound was towards the locator. And ours was at Onttola airfield in Joensuu. We flew for about ten minutes inside the cloud and thereafter the pilot took us below the cloud base. We were lucky enough to spot the Brewsters far away and they spotted us as well. They knew we were coming so they rocked their wings, then one of them went in front of us and the other behind us. We made it to the airfield but nothing could be done for Atte, as he had bled to death. The floor inside the aircraft was all red, as his blood had trickled along his leg to the floor and then all over the fuselage between all these equipment on the bottom, the photography windows and so on. It can be said that as we got the FuGs in the planes and as we were trained to use them, so the safety increased at least with the bombers. It wasn't like the one night bombing to Seiskari when a terrible fog turned out, it must have been one of the worst losses of the Air Force. 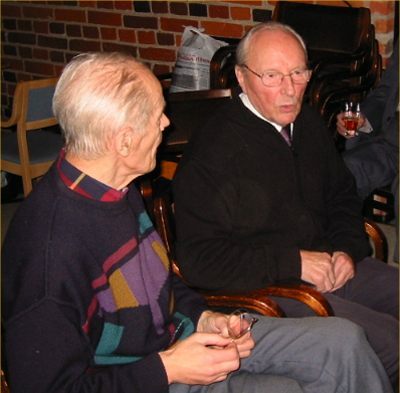 Torsten Sannamo and Kauko Aho, squadron mates still together after 60 years. 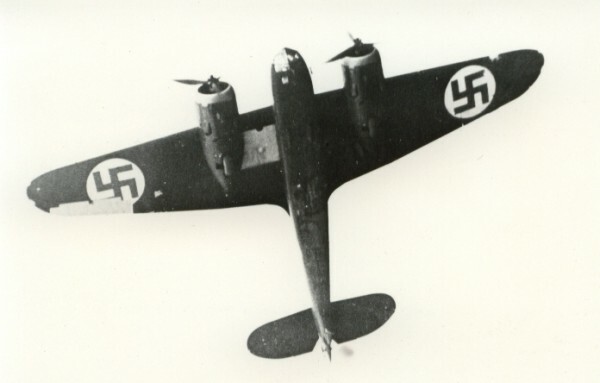 Kauko Aho: How many of them were there in a squadron at that time? I did not experience that personally and I don't know the exact number. By a rumour, they were five. But there were many anyway. There were many others of us, and just for the same reason, bad radio communications many times, at least at Lavansaari. We got to land from this flight aided by three barrels of petrol that were lit up in fire at the end of Värtsilä runway, and they told us the approximate height of the flames, so the pilot could set the right altitude. And down we came, but it was pure luck that Pasi Alama saw the ground and managed to stall us on our wheels so we finally got there. So technology isn't bad wherever it can be properly utilised. And I have been delighted about you young people, who have a hobby of technology. It will develop your ability to think and hopefully it will also help you as humans, to see how much we need each other; so was it in those planes as well. The three of us in the crew had a good spirit, and it often secured us to make it back to the field one way or the other. These are my greetings from 50 years ago, or 60 years really, because I was 20 then and now I just had my 80-year anniversary last summer, with this nice trembling on top of it. 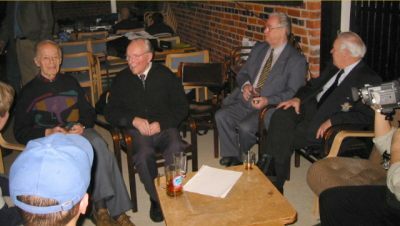 Kauko Aho, Torsten Sannamo, Torsti Tallgren and Lauri Väisänen, honorary guests of the Finnish Virtual Pilots Association Urban Blitz 2002 convention. 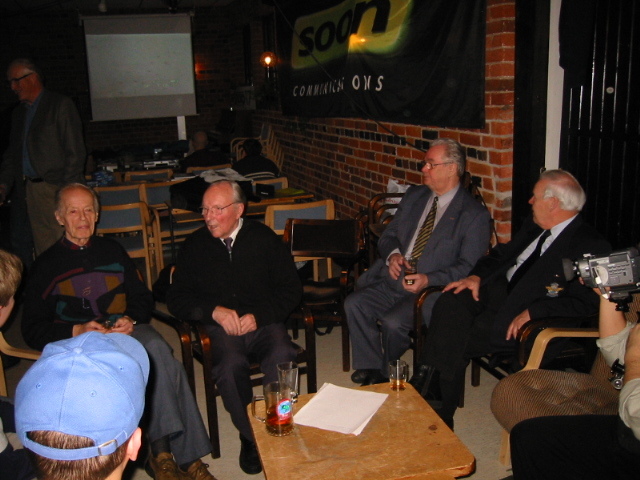 This article features the speect by Torsten Sannamo, which he gave in the Finnish Virtual Pilots Association winter convention Urban Blitz 2002 at Tampere 2nd February 2002. Photos: Blenheim VIA Finnish Virtual Pilots Association collection, FuG-radio Pentti Kurkinen.